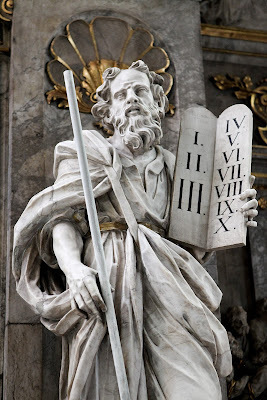 Based on the popularity on my blog of the post The Dao of Investing - It's time to sell, I'm guessing investors are looking for indexes to help them take the temperature of the market. So this week I will revisit an indicator I developed in my book Financial Bull Riding. The method for building the index was based on a technique developed by James Estey in his book Business Cycles published in 1950. Estey included a chart of business cycles from 1790 through 1949 in which he plotted economic activity similar to GDP. Armed with dates for business cycle peaks and troughs, he de-trended the data by calculating the average for the series between peaks, then between troughs, then averaging the two series to obtain an average for each business cycle. Then he subtracted monthly figures from the cycle averages. The chart below appears in my book and plots the quarterly deviations from the averages for stocks and profits using Estey’s method and the dates for business cycle peaks and troughs established by the National Bureau of Economic Research. The amplitude of each plot depicts the percentage deviation from the average value for each business cycle since 1950. 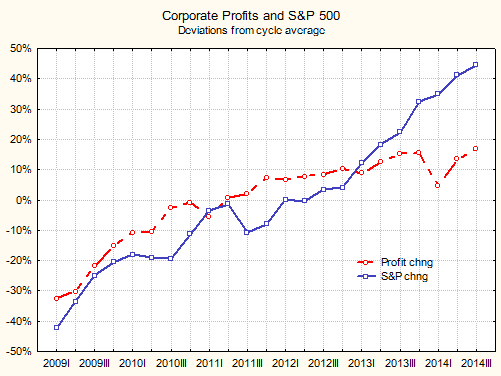 The red line shows the deviation of corporate profits from the cycle average. The blue line tracks the S&P 500 index's deviation from its average for each cycle in a similar manner. Clearly, the market follows profits closely except for the period around the dot.com bubble. Since the "recovery" as measured by the National Bureau of Economic Research began in 2009, I have included data from then until the third quarter of 2014, the latest data available. We haven't suffered a recession, yet, so the cycle this far contains nothing but the expansion leg of the cycle. As the reader can see, the S&P 500 tracked the deviation in corporate profits during this expansion closely until about the third quarter of 2013. 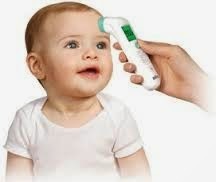 However, by the last quarter the market had climbed far above the change in profits. The first chart above from Financial Bull Riding suggests that when profits deviate from the mean by 20% they signal that a market top has been reached. 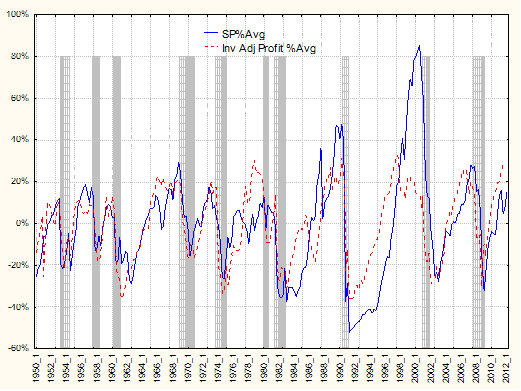 But so far in the expansion phase of this business cycle, profits haven't yet reached the 20% deviation level. The closest they got was 17% and only reached that in the last quarter of 2014. Still, it looks as if the change in corporate profits has reached a peak and will probably not reach the 20% change from the cycle mean soon. However, keep in mind that the cycle mean is a moving average. If the next quarter brings news of record profits, the moving average will rise slightly and cause the deviation from it to fall. But if profits fall, the moving average will decline slightly and could push the quarterly deviation above the 20% level. The more popular indices, such as Spitznagel's Misesian Stationarity (MS) index, Shiller's Cyclically Adjusted Price-Earnings (CAPE), Tobin's Q, and the market capitalization to GDP ratio, Warren Buffet's favorite, would have signaled to investors to quit the market a year ago. My indicator would probably have kept investors in the market at least until the middle of 2014. Still, it's time to divorce the stock market.